A comet is an approximately spherical body that may be up to around ten kilometres in diameter. It is made up of ice and dust. Its name comes from the Greek coma meaning "tail". When a "dirty snowball" approaches the Sun, part of its material sublimes and the body develops a tail of dust several million kilometres long. This material reflects the sunlight making the comet visible from Earth. Comets were formed with the solar system in the cold regions 4.6 billion years ago. In 1950, the astronomer Jan Oort hypothesised the existence of a spherical reservoir of comets at the confines of the solar system. Following gravitational instability caused by the movement of nearby stars, some of the bodies would "fall" towards the Sun from time to time, in a parabolic trajectory. A comet from the Oort cloud only passes near the Sun once; it is said to be non-periodic. 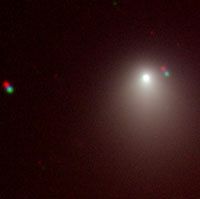 Other comets such as Halley's comet are periodic, passing near to the Sun regularly. When passing, they lose part of their mass, eventually "going out" when there is no more material to sublime. The lifetime of a periodic comet is very short in comparison with the age of the solar system. We said that comets were formed at the same time as the solar system. So why are there still periodic comets? Some comets from the Oort cloud can pass near to a planet during their trip around the Sun. Their trajectory may then be modified and may result in an elliptical orbit and hence a periodic comet. This mechanism explains how periodic comets can exist at all epochs.